The Phoenix built up a 4-2 lead over the first period and a half against the Victoriaville Tigres in their preseason game Friday night. 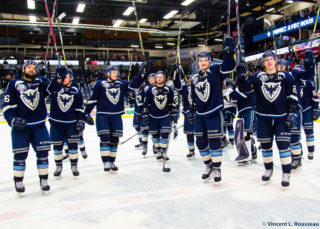 The last period and a half was Victoriaville’s game though, as they scored five straight goals to take the lead away from Sherbrooke on their way to a 6-5 win over the Birds. 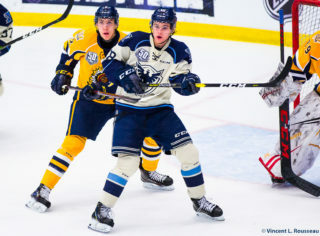 Victoriaville opened the scoring in the first period with a goal from Félix Lauzon. The Phoenix took control after that with four straight goals, three in the first period and one in the second. With Kevin Gilbert scoring to tie the game 1-1 assisted by 2016 10th overall pick Anderson MacDonald. After Gilbert opened the scoring for Sherbrooke, Julien Pelletier scored two straight power play goals to close out the first period. 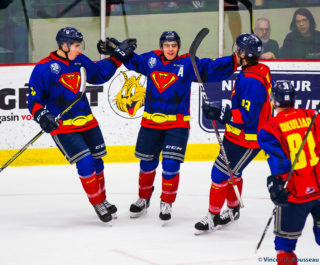 MacDonald then scored the last of the four straight Phoenix goals making it 4-1 for the visitors before Victoriaville would go on their own scoring spree. Jacob Lapierre scored at the 7:10 mark of the second period on Evan Fitzpatrick to make it 4-2. Fitzpatrick was swapped out a few minutes later after just under 29 minutes of game play to give rookie backup goalie Justin Blanchette some playing time in the exhibition match. Fitzpatrick saved 20/22 shots with two goals against in his half of the game. Victoriaville clawed their way back, eventually taking the lead by scoring four straight goals to retake the lead with three special teams goals in the second period and another two goals in the opening minute of the third period making it 6-4 for the black and gold. Russian native Yaroslav Alexeyev scored with 1:48 remaining in the third to make it a one goal game giving the Phoenix a chance to tie and force overtime. The Birds weren’t able to tie it as James Powall shut the door on Sherbrooke in the last minute, giving Victoriaville a 6-5 preseason win. Rookie Anderson MacDonald led the team with three points (1G, 2A) and Julien Pelletier led the scoring with his two power play goals. Rookie goalie Justin Blanchette stopped 17/21 shots in the loss. The Phoenix will next play the Tigres again in a preseason game to close off their home-and-home exhibition series with each other. 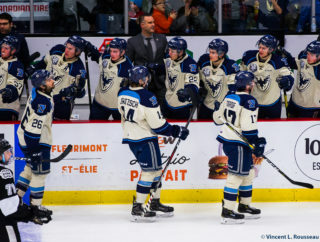 The game will be Sunday in Sherbrooke on September 11th at the Palais des Sport Leopold Drolet, with the opening puck drop scheduled for 3 p.m.